Let it snow! Let it snow! Let it snow! It’s warm and cozy inside! Are you ready to kick back and enjoy the peace, quiet, and beauty of the North woods? This is the perfect place to hike, play on the water, observe nature, watch the moon rise, and breathe the fresh clean air! Book now and be sure to have a cozy home in which you can escape the hubbub of daily life! Our home is the perfect place to kick back and relax in the peace and tranquility of the North Woods. Access to Lake Independence is just down the road. And the snowmobile trail is at the back door. Lake Independence is known for its Perch, Walleye, and Northern Pike - in summer and winter. Lake Superior is 3 miles away. Or you may opt to take advantage of the tranquility of McKenzie Bay. Our home sits on this small motor-free lake and offers great bird watching and abundant wildlife. If you time your visit right, you may be able to see the beauty of the moon shining across McKenzie Bay. We are on County Road 550 just minutes away from the historical village of Big Bay. This former lumber town is known for having produced the wooden panels for Henry Ford's Woody cars and for producing Brunswick bowling pins. There are abundant opportunities for fishing, hiking, waterfalls, biking, swimming, water skiing, snowmobiling, cross county skiing, all within the picturesque area of Big Bay. This is a vacation spot for all seasons for anyone wanting to escape the hustle and bustle of daily living. The serenity and seclusion we offer is a great opportunity to spend time with those you love as you enjoy the beauty of watching the moon rise over the water, geese and ducks flying in and out, or witness an eagle or osprey catching their dinner. Song birds fill the mornings and evenings with their lilts. Our family home offers the amenities of a home and is filled with memories of our parents and special family times. The walls tell the story of the love between our dad and mother and eight children. Come sit by the outdoor firepit and enjoy the many splendors that nature has to offer and enjoy the shimmering beauty of the moonlight on McKenzie Bay. Or curl up by the indoor fireplace and enjoy the comfort of watching the dancing flames. Our parents first came to this area deer hunting in 1937. From then on it was a love affair that captured their hearts and finally moving here permanently in 1972. For the 8 of us children it was a vacation paradise and has become home for 7 of us. Our parents taught us many strong family values and maintaining their home for others to share has become a priority since their deaths in 2005. You get a real taste of local history and the dedication to family and life that they shared. If you enjoy watching birds out your window, deer grazing by the water, eagles flying over the water in search of dinner, watching the beaver swim, and the sound of a Sand Hill Crane, you will love our location. The rolling lawn is adjacent to the woods and gives a sense of privacy. This is truly a home to relax and enjoy your vacation, away from the busyness of the city, yet close enough to enjoy the highlights of Marquette and natural beauty of Big Bay. There is plenty of room and all the amenities of home. Lake Independence is only a mile away and is known for its perch, walleye and northern pike. McKenzie Bay offers solitude and fun catching perch or pike - when the ice is thick enough. Small, motor free, self contained lake ideal for small pan fishing and observing waterfowl and wildlife. Not safe for ice fishing. Thomas' Rock offers panoramic view of Lake Independence and Lake Superior. Handicapped accessible. You will find salt and pepper and a few basic spices. Deck on upper level and patio on lower level both with lake view. Mackenzie Bay Retreat was a lovely place to spend a week enjoying the end-of-season snow and friendly people of Powell Township! Clean, comfortable, and cozy. Darlene and Louise were excellent hosts and made sure we didn't want for anything. The WiFi at the house is great, and the kitchen is well appointed. Close proximity to Thunder Bay Inn, the Lumberjack, beaches, and hiking trail. Could not recommend more highly! Very nice place in a great location that provided a wonderful vacation to enjoy a UP winter. The home is very well maintained with all of the amenities we were looking for. Beautiful property and would like to stay here in the summer as well. Thats right its everything and then some. Very private, close to restaurant and store. The home is clean, comfortable and well equipped! Fabulous fireplace downstairs and super easy to operate!! There were several duck families in the lake! Bonus! Binoculars and telescope provided! Low traffic road and picture perfect surroundings. Dont spend money on a run down rent-a-wreck when you could stay here! Absolutely the best place we have ever stayed! Everything clean and the amenities nice. The owners live near and are quite responsive to any need or query. The cabin is quite large and apparently was the family home. Overall a lovely, comfortable and peaceful experience. The care of this homestead is very evident in this spotless house, in a beautiful location, with loving family mementos preserved in honor of the family. This property is very special! We spent ten days here and felt right at home. The house is well furnished and decorated with family history. The view cannot be beat and we spent many relaxing hours in the sunroom reading and using the furnished binoculars for beaver and duck watching. The paddle boat was a fun addition. Would highly recommend this wonderful restful house to everyone. 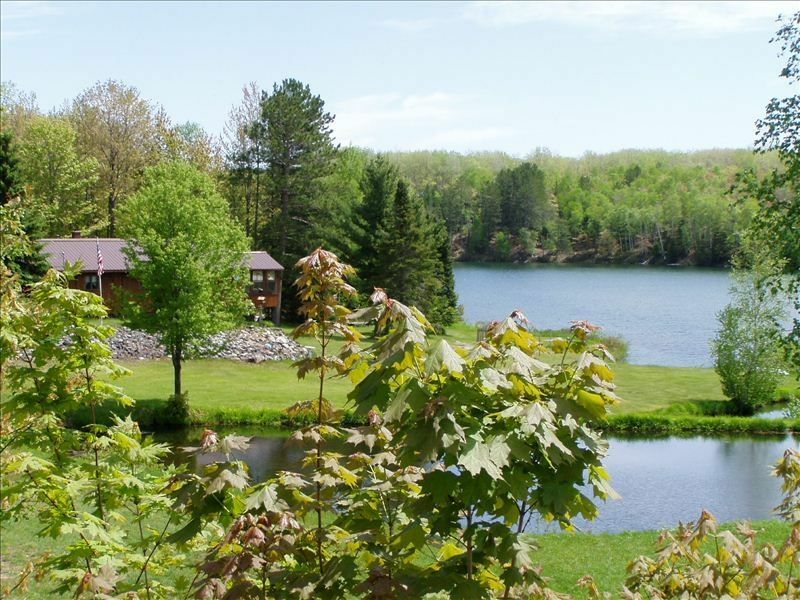 Thomas' Rock offers a universally accessible view of Lake Independence, Lake Superior and surrounding country side. Beautiful view!